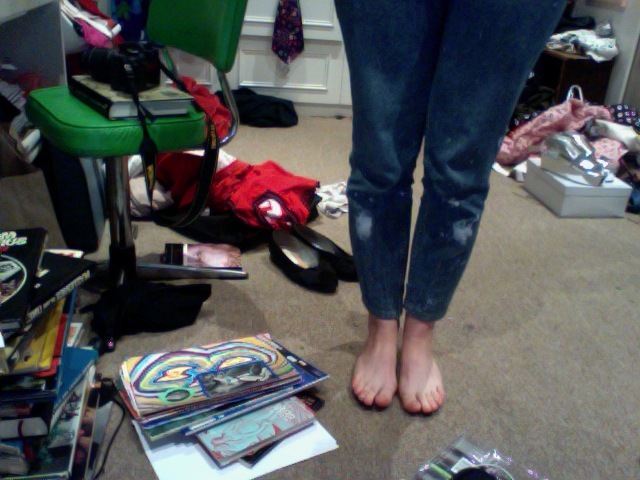 After wearing these jeans the past couple of days I've succeeded in totally ruining them. I didn't set out to do so but as usual when I wear clothes to do painting I say I'll be careful but never am. I reckon I'll keep them though, as my 'install jeans' - I can collect paint stains on them from various shows I have to hang and they can be like good luck. Anyway this brings me to talking about the things I don't think about installing an exhibition. I really hate measuring. Usually, when in my studio I measure like Mr.Bean does in that episode where he steals the Mona Lisa or something and use my arms stretched out really wide with my fingers as markers. It's pathetic. What's worse, is the inevitable question "IS IT STRAIGHT?" (The title of a group exhibition I was in this year, too, ha) The answer, when I have been responsible for hanging a work is always "NO!". These past few days I've had to use rulers, MATHS and levels. It's awful. I also hate being discerning about my work. My practice has a lot of nooks and crannies and I like to include the whole spectrum. This often looks like a hotch potch though, and constantly I am forced to be ruthless with editing. Ditch that, ditch this, scrap that, that needs to hang on it's own... I find these suggestions frustrating mainly because my head knows they're right but my heart won't let go! What I love about installing though is that at the end of it I know my works are going to be emanating straightly from the wall and hoards of people can experience them. I will stand around in the silver platforms you can see in the blurry background of the above picture and soak up the glory of my creations that now exist as separate entities - I think hanging severs my physical ties with the work and frees me to make more.